This is a great flash animation made by Alan Becker.So why is so great you wonder ? 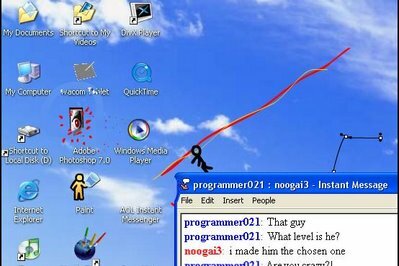 You have to see it to belive.The animation starts with an user who draw a little man in paint, and that little man get control over the entire desktop, and he begin to destroy everything on the desktop.I must say that this is very creative and also hilarious. - Press the picture to see the animation.On the same website you can also see the first part of this story. Enjoy !